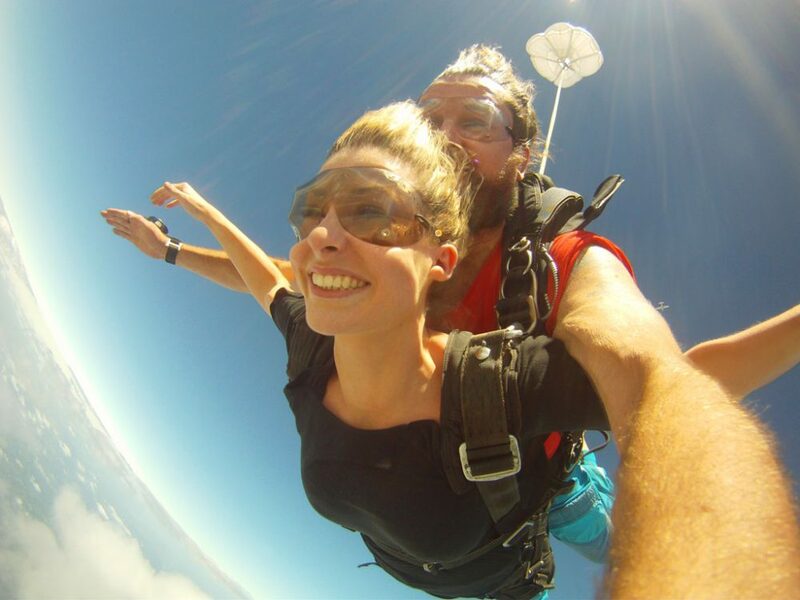 Jumping out of a plane at 14 000 feet above land is a horrifying concept to Alissa Jenkins, but in the name of research she does it anyway. Every bodily response suggests this is not a good idea. Racing heart, sweaty palms and nauseating stomach-flips have well and truly set in. Convinced I am about to meet my mortal end, I am on the way to Sydney International Regatta Centre near Penrith Lakes where I will prepare to skydive over the city. After filling out numerous forms (which although necessary is not reassuring), I change into a pair of super-flattering blue skydive pants, while staff decide who will be teamed with who for the impending tandem jump. 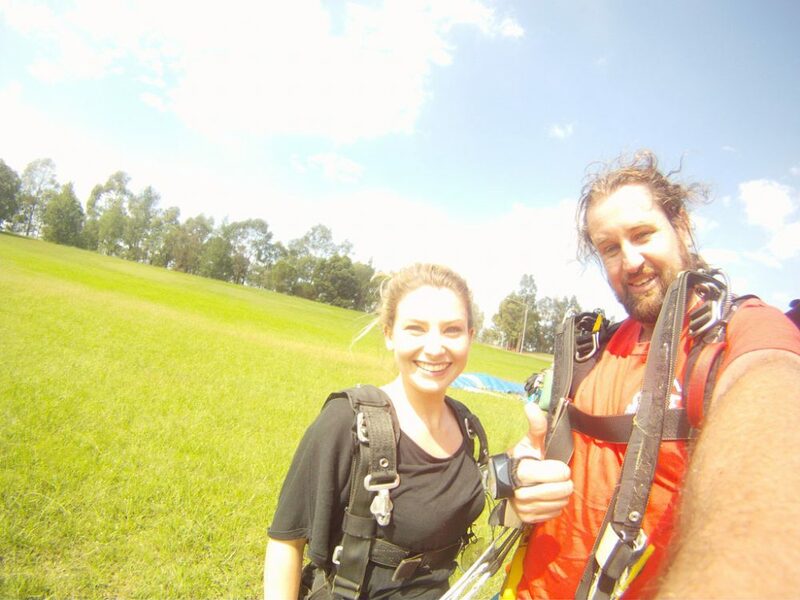 I’ve been teamed with Adam, an experienced skydiver who has jumped all over the world. Although he tries to make light of the situation and calm my nerves, I still feel ill.
Three tandem teams (including Adam and I) soon load into a shuttle bus and head to Sydney Metro Airport in Camden, where the light aircraft that will fly us up is located. It’s a picturesque country drive there, passing lush green paddocks and grazing cattle, and for a moment I almost forget that I am about to jump out of a moving plane. Once we arrive, Adam straps me into a harness and gives a quick lesson on how to position myself throughout the jump. Arms crossed, head back and arched back until he gives the signal that I can put my arms out. It sounds easy enough. 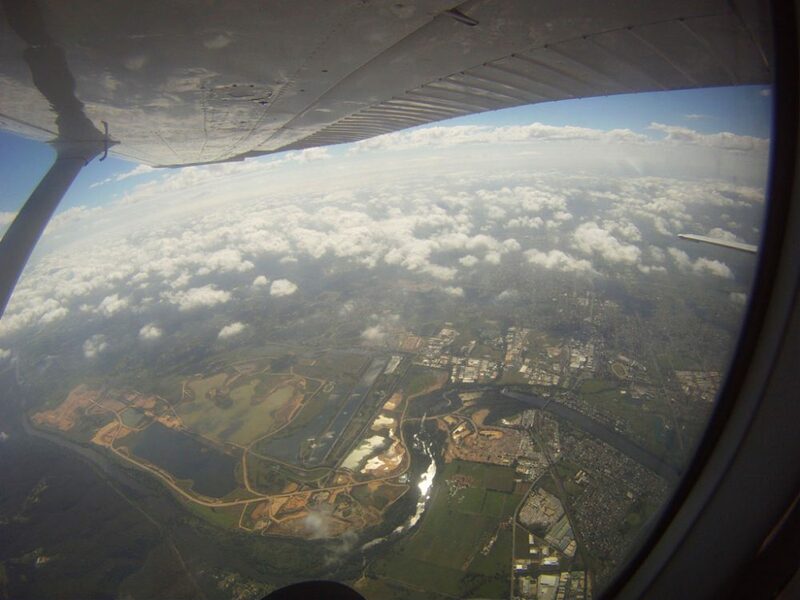 As we fly higher and higher, it becomes increasingly cool in the aircraft, but with the amount of adrenalin pumping through my body right now I am relatively numb. 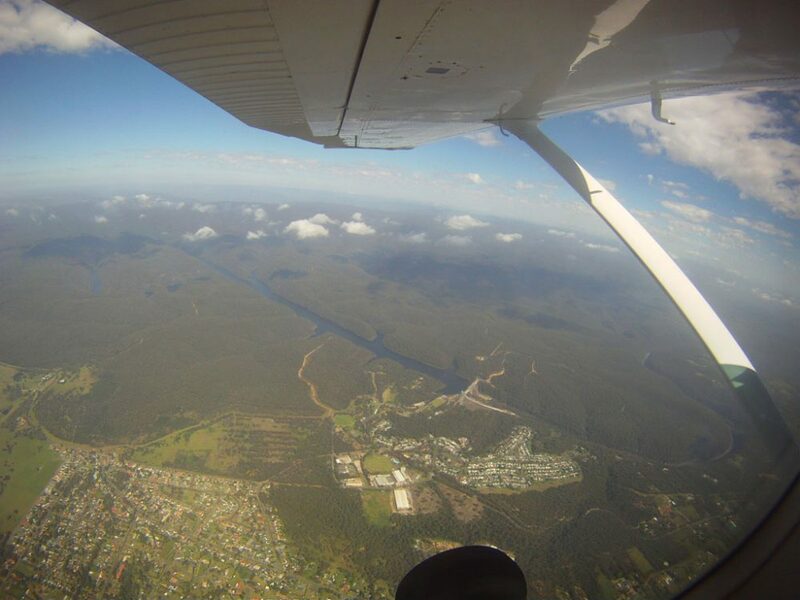 We fly over Penrith, surrounding suburbs and Warragamba Dam. From one side of the plane I can see over the Blue Mountains as far as Lithgow, from the other side I can see the city skyline. I am told that on a clear day you can see the Sydney Harbour Bridge from here, but unfortunately it’s a bit too hazy today. Once we reach 14,000 feet, the time has come to jump. The first team prepare to go, sitting on the edge of the opened aircraft and then in an instant, they’re gone. I almost vomit. Adam and I are next. To give a true insight into my thoughts right now would involve a constant stream of expletives. We shuffle over and position ourselves on the edge. Legs outside and folded underneath the plane, arms crossed, head back and a forced smile for the camera before we’re off. Suddenly we’re falling. Tumbling and spinning like we’re in a waterless washing machine. I don’t know which way is up, down, left or right but after a few moments we reposition ourselves so that we’re falliing belly first. I soon get a tap on the shoulder from Adam, signalling to put my arms out like wings. 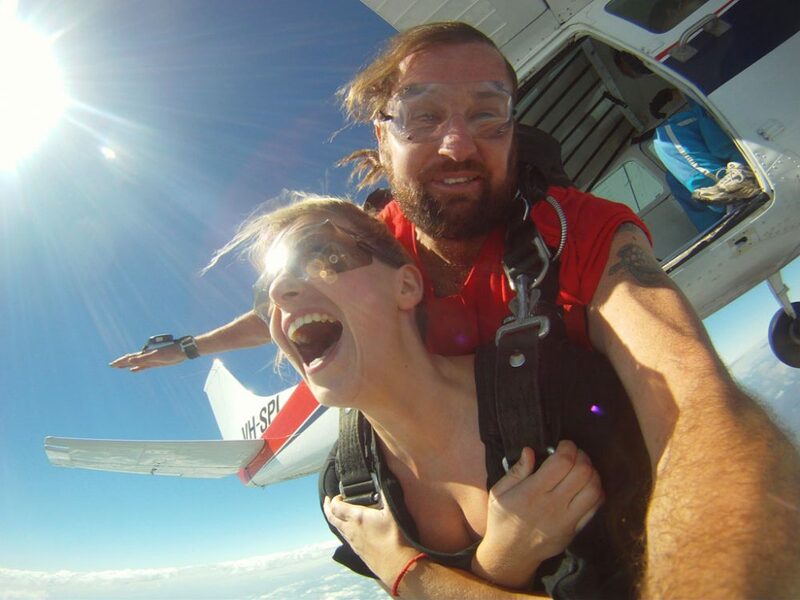 This is the part I was most afraid of; free falling at speeds of over 200km/p/hour – without a parachute. Instead, quite the opposite occurs – this is the greatest feeling ever! I have never felt so free. There is something strangely peaceful about being above the world, unable to hear anything but the wind rushing past, just enjoying the sensation of flying (or falling; however you want to view it). As we pass through clouds, circular rainbow patterns appear and disappear in a flash. I forget why I was so scared, this is amazing! After free-falling for about 60 seconds, Adam releases the parachute, the harness shifts and our legs kick under so we fall feet-first. He allows me to take control of the parachute straps and try ‘spiralling’, which involves pulling hard on one strap so we fall in a fast corkscrew-like movement. I scream, but not in fear, in excitement. This is better than any theme park ride. Admittedly after a few attempts though, motion-sickness sets in. We soon approach the landing zone, marked by a cross near the regatta centre. Adam guides us in and with our legs out in front to form an L-shape, we slide across the grass like a big slippery-dip. Like most ‘jumpers’, I am on such a high afterwards. Not just because I survived and am safely back on land, but because it is such a freeing experience. I feel like I now need to do something momentous like get a daring new haircut or declare my love for someone. Needless to say, it was definitely worth the nerves. 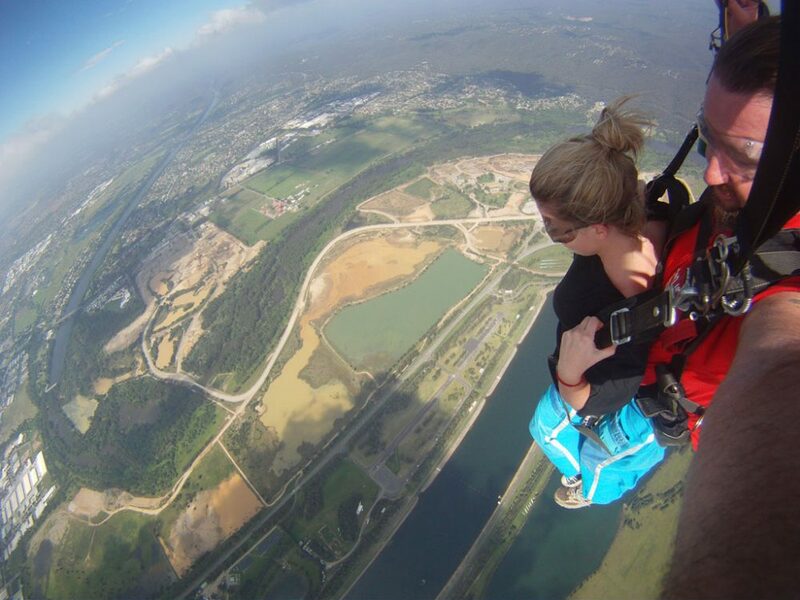 Alissa was a guest of Sydney Simply Skydive and Penrith City Council. – Prices vary depending on the height at which you jump. – Extras are available to capture your jump. – Simply Skydive run a free shuttle bus from various points around Sydney such as Central Station, out to the Regatta Centre and back. It’s great for those who are too distracted on the day to drive. Ask for times and locations when booking. – Ladies, given the speed at which you fall, remember to wear a top with a relatively high neckline, otherwise you may inadvertently perform a peep show.